Pandas are just drunk other bears. Temperatures neared 100° today in Portland. The entirety of this week has been a sweaty nightmare, every day reaching the nineties. This type of heatwave is a rarity in my part of New England. (Perhaps not – maybe this happens every summer but my sunbaked brain simply blocks out the terrifying, sweltering memories?) Either way, I don’t enjoy the heat. If I had air conditioning and only needed to go outdoors to swim in the ocean, I would not mind it. Unfortunately, work and poverty dictate otherwise, thus I find myself roasting in my third floor apartment. Here at the parking garage we have a sputtering underdog of an air conditioner, and while I appreciate it’s efforts, the meager amount of air it expels is just not enough to cool me. During childhood I waited all year for weather like this. I had nothing to do other than lounge at the shore and drink plastic-encased sugar waters or loaf around in my parents’ pool. There were always sandwiches, often Cheez-Its, and life was breezy. I did make it to the ocean today, and swam one other time this week. The water was crowded with people and seaweed, but nice. I hear the heatwave is due to break over the weekend, and Maine will resume its regularly scheduled weather pattern on Monday with temperatures in the seventies. I hope so, because I have a bunch of baking projects lined up for next week. We’ll still be consuming a lot of carbohydrates and cheese, but we’re taking this healthy thing in baby steps. Anyways, healthy healthy, etc etc. I’ll post pictures of any successful meals. 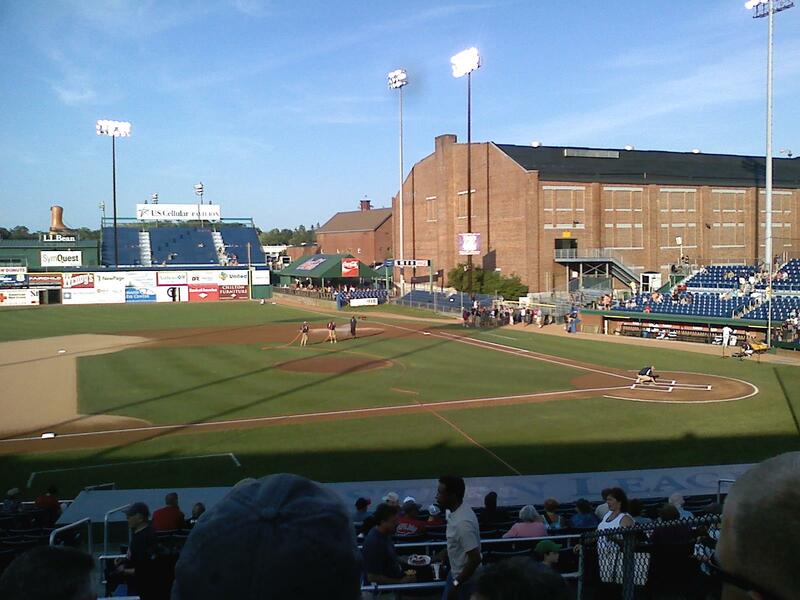 One other fun adventure from earlier in the week was a trip to a Seadogs game! My love of baseball and fried food combined to create one night of summer bliss. 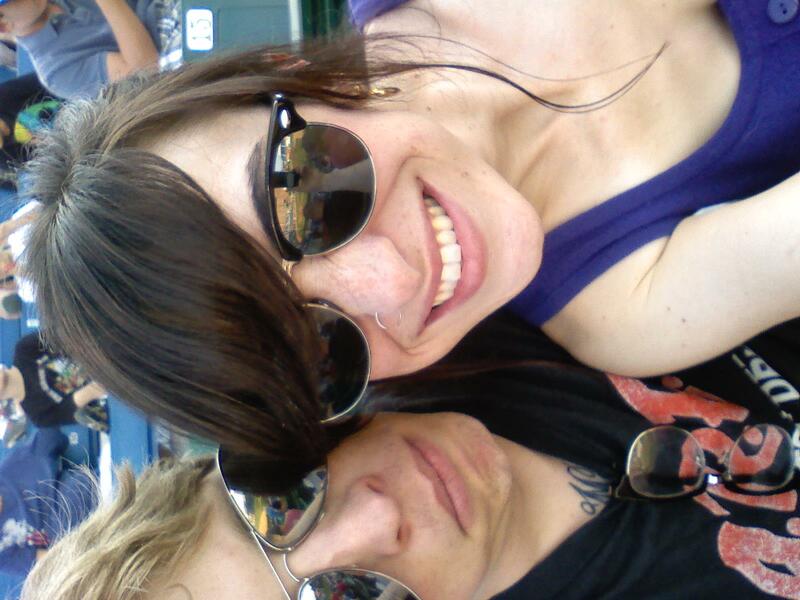 Also, it was Josh’s first time at a baseball game. The Seadogs lost miserably to the Bingingham Mets, but luckily minor league baseball is more about watching kids race mascots around the infield and crap like that, so we really enjoyed ourselves. Gorging oneself in the outdoors seems to always make for a pleasant evening. On the list of snacks we had at the game? A soft pretzel, fried dough, french fries, soda, beer, and two ice cream sundaes. Oh, also a Seadog biscuit (aka ice cream cookie sandwich). I think I’ll take a stroll around my little booth now and sea if any cold air is coming in off of the water. Next time I report back, new projects of the craft and food variety will have been undertaken.